Sri Saraswathi Vidyaalaya Matric Hr. Sec. School, Cuddalore has advertised in the DINAMALAR newspaper for recruitment of Teachers PGT / TGT Plus Wardens jobs vacancies. 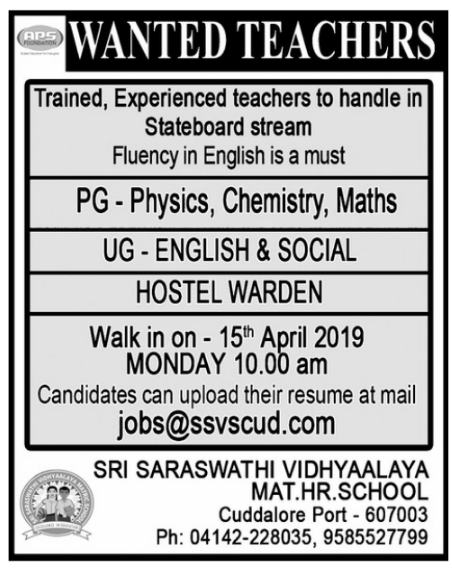 Interested and eligible job aspirants are requested to walk-in 15th April 2019. Check out further more details below. About School: The school is recognized by the Education Department of the Govt. of Tamil Nadu and is under the jurisdiction of the Director of Matriculation Schools and the management of Sueeladevi Academic Educational Trust. When the school was founded in 2003 there were just 10 students. As we opened our doors to the academic year of 2012-13, we reached strength of 1250. The ideals of our mission and philosophy have served as our compass throughout this period of rapid expansion. SSVS plays a central role in the life of the community. We got upgraded as higher secondary school in the year 2010-11. How to Apply: Interested candidates are requested to send soft copy along with copies of certificates, passport size photograph, PAN card Xerox and Aadhar Card Xerox to the email address provided below and then attend the walk-in interview.